Do you ever feel as if you aren’t getting much out from your workout, no matter how long you have been going at it? For people that have been into fitness for a while, this becomes a regular problem since their bodies are already used to lifting their own weight. In this case, opting for the best ankle weights might give you that edge you have been looking for. It’s not very easy to find the perfect ones since they all have a different comfort zone; but if you are looking for ideas, this article will definitely help you out. 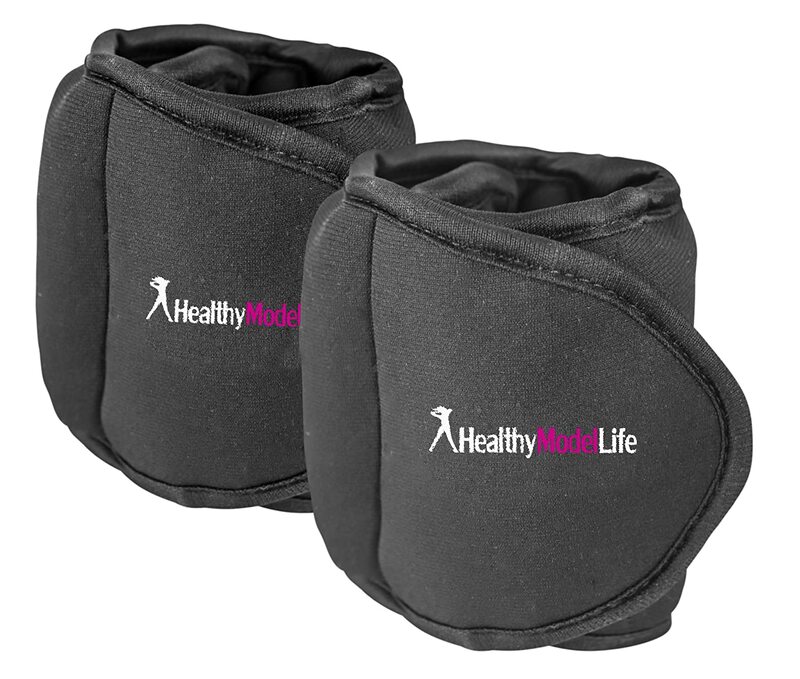 Just like dumbbells, ankle weights come in a variety of difficulty levels, from easy 2 pounds up to more challenging 20 pounds. They can be bought easily from Amazon or any other online website – or even the fitness store next to you; ankle weights are usual accessories, so they shouldn’t be too difficult to find. 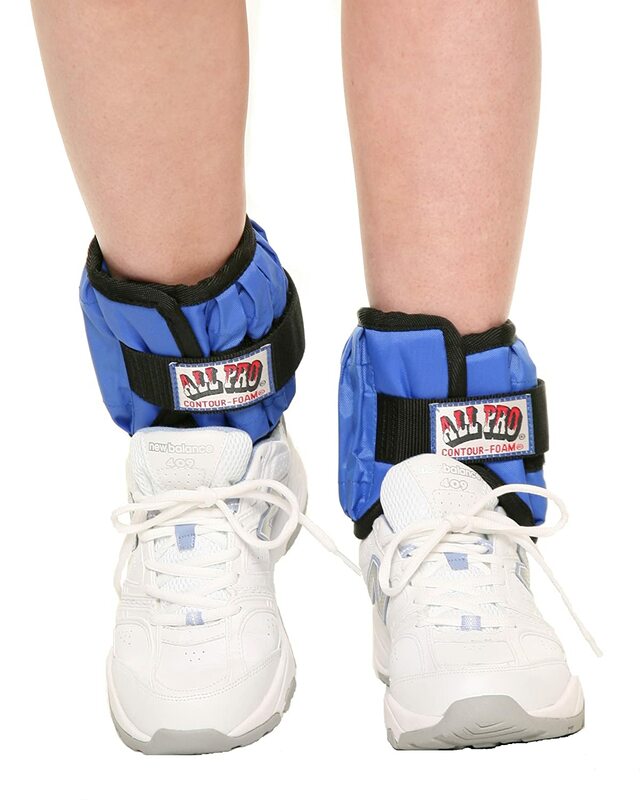 Keep in mind that if you have knee, hip or any ankle problems, your ankle weights should be used sparingly. You may also opt for a pair of weights that can be strapped to the thighs; the feeling may be awkward at first, but it will get you to work the muscle without putting too much pressure on the knees. Ankle weights are great if you are looking to provide extra resistance to your workout. Recommended mostly for strength training exercises, they increase the level of burned energy during your workout – allowing you to burn fat and build muscle in your legs much faster. Ankle weights are the perfect option if you tend to work out alone at your home, without access to the machines at the gym. They offer the best benefits when you perform slow but controlled exercises. Remember that if you have weak joints, using them in activities such as walking, hiking or jogging may prove to put too much of a strain on your legs. Even the best ankle weights will not prevent injury if you are not careful enough. Fixed Ankle Weights – As the name suggests, they have a weight that you cannot change. You can get them from 1/4 pounds to 25 pounds. Adjustable Ankle Weights – These are more versatile than the fixed ankle weights since you can change how much you add to them. By adding weight bars in pockets, you can customize your needs and improve your strength without having to buy multiple devices. As a beginner, you may want to go for a lighter resistance and get some fixed weights to help you through. If you are a pro, on the other hand, some adjustable weights may be a more suitable choice. Regardless if you are just walking around the house, down the stairs or wearing them to do your grocery shopping, ankle weights will be great to offer you a workout without actually having to go to the gym. You already have to walk a lot every day, so why not take advantage of it? If you get such a kick from walking, imagine what running with weights can do to you. Using ankle weights while on your daily jog will help you become stronger, quicker and make you lose weight much faster. You may ask “why wear ankle weights if I’m boxing?” Well, you do so to improve your endurance and foot speed. If you wear them a lot during training and then take them off right before a fight, you will feel as if you are as light as a feather without them. The same principle from boxing will apply here as well. For instance, if you are a basketball player and train with ankle weights, you’ll add difficulty to your legs as you jump; imagine what will happen once you take those weights off. You’ll literally soar into the sky. Ankle weights are also great to strengthen your abs, for instance when you do criss-cross abs or other movements where your legs are hanging in the air. You can read here some other ways for using ankle weights as well. Once you have decided to set on your fitness journey and purchase some ankle weights, you may not know exactly where to start looking for some good products. In this case, I have taken it upon myself to bring you the best ankle weights in terms of popularity. While they may look like they have been pulled out from the 80’s, these ankle weights sure know how to provide you a great workout. With the weights made from solid iron, you can get up to 5 pounds per ankle, with 1/2 pounds increments. The packaging weighs 10 pounds per total, and you can easily assemble them once you have taken the belts out of the pack; just include how much weight you want to be added to them, and you’ll be good to go. Considering the price you pay for them, I’d say it’s worth the value. They may be a bit more expensive than your average ankle weights – but they sure make up for it regarding durability, quality, and comfort. These All-Pro weights are equipped with cushioned flaps which have the role of protecting the ankle, providing comfort and allowing a decent freedom of movement. You may be carrying weights around with you, but that doesn’t mean that your movements have to be restricted. Due to the Velcro straps, these weights are easy to adjust to your own ankle size. This way, the weights won’t be flapping around, allowing you to proceed with your workouts while feeling secure. They are bulkier and larger compared to normal fixed ankle weights – but that will also depend on how much you add to them. If you are a beginner and only add half the weight, it will be just as large as a fixed ankle weight. These ankle weights are a great choice, regardless of your fitness routine. You can wear them around the office as you walk, or you could take them on a morning jog. It’s a good way to train your glutes, quads, and hamstrings. And be careful how you step AFTER the weights go off. The reason why I like these ankle weights is that they are so sleek and easy to attach that you won’t even notice yourself wearing them once you get used to the weight. They are cheaper compared to your premium set of ankle weights, and they provide features that are just as useful. They weigh 3 pounds, and once you take them out of their package, all you have to do is strap them on. Each of them weighs 1.5 pounds, so they’re perfect if you are at the beginning of your weight training journey. These are some very versatile ankle weights because unlike other models, these can be transformed in wrist weights as well. The Velcro adjusting is secure, and they will fit just around your ankle so that they don’t slip. The fabric is pretty functional: made from quality neoprene, the weights are non-abrasive and will absorb the moisture if you tend to perspire a lot. 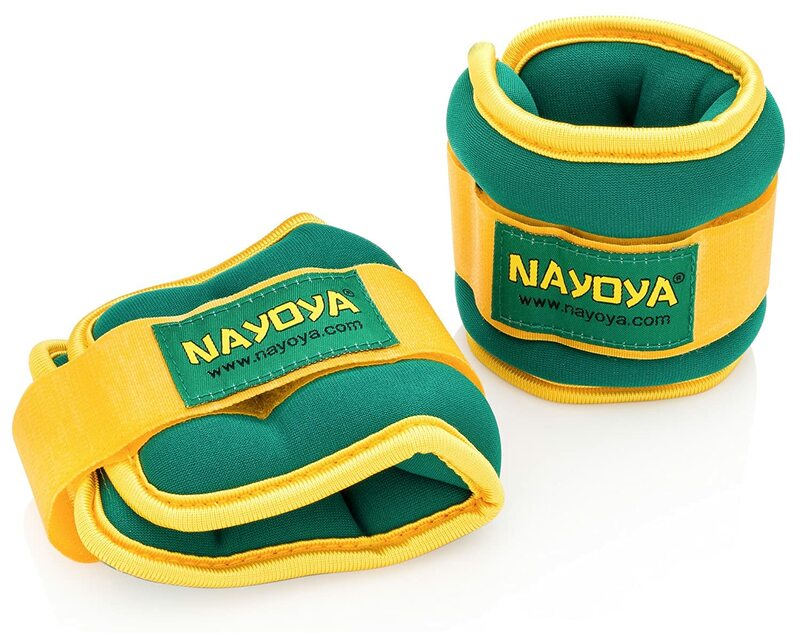 Used with or without the weights, the Nayoya can be used to secure ankle sprains and strengthen the muscle. Overall, I liked these weights because they are a great option to tone your legs and thighs during a Pilates session or a jog in the park. Thanks to the padding, they are very comfortable and won’t chafe the skin around your ankles. Used regularly, you will definitely notice an improvement in your muscle health. 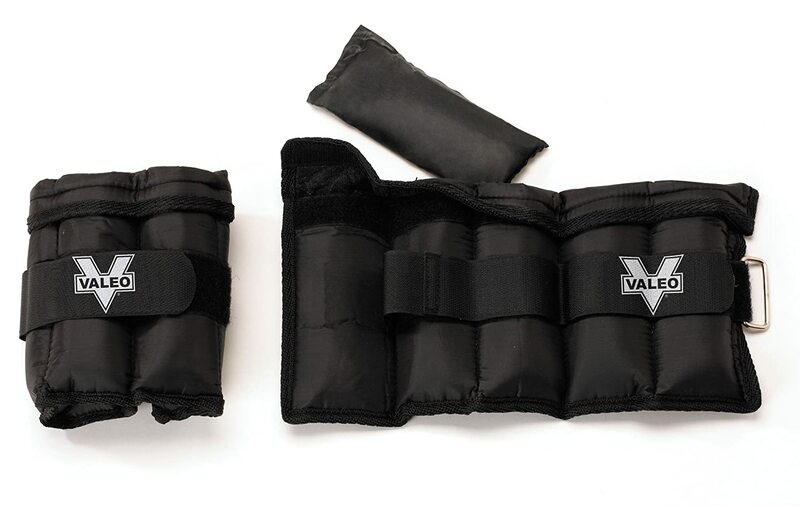 These adjustable ankle weights are also popular because they can be used as wrist weights too. The difference is that, unlike the Nayoya weights, these can reach up to 10 pounds each. Together, they weigh 20 pounds, which can be used right from the moment you take them out from their box. Each of the weights is equipped with two sandbags, every piece weighing around 2 pounds. The packs can be easily removed to get your desired weight, so regardless if you are a beginner or an expert, you can still get a good custom weight. These ankle weights feature self-gripping closure so that you can easily remove the weight packs, but also a D-ring adjustable double-strap closing system which will enable you to get a snug fit. The ankle weights are generously padded, so regardless of the intensity of the training, you will not feel any discomfort from the weight. Everything will only boil down to the actual weight you’ll be carrying. The price is average considering that they are professional ankle weights, but considering their quality, I’d say they are worth it. They are very comfortable, and as long as you shake the sand in place, they will do a very good job. Many people love these weights due to the comfort that they provide. If you feel like you can’t get comfortable with regular ankle weights, then you may want to gives these set a try. 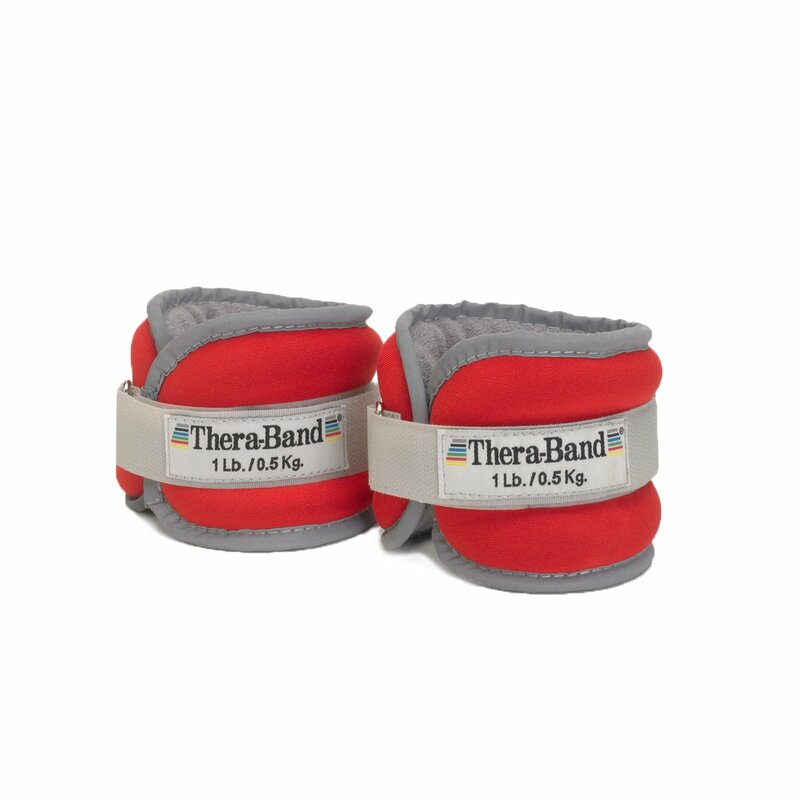 The TheraBand weight set features a durable and sleek neoprene exterior help together with an adjustable Velcro strap, and the interior was made with non-abrasive, soft terrycloth. This not only makes the weights highly comfortable but moisture absorbing as well. While the fit is adjustable, the weight is fixed. They only have one pound each, although you can also purchase them in 3 or 5 pounds per set. Each weight set will have a different color, so not only will they be stylish, but they will also be easy to differentiate. They are easily stored in a jar-like cylinder and can be easily taken out and adjusted in just a few seconds. It’s a great option if you do a lot of home exercising or if you engage in casual walking or running. They are fairly affordable, and you get a good weight out of them that is comfortable to wear during an exercise session. Keep in mind that since the fabric is not waterproof, these weights aren’t exactly suitable for water-based sports. However, for a regular aerobics session, these should do the job quite good. This weight set is very popular among women since it has been specially designed to fit the woman’s physique. Considering that women are slimmer, it’s hard to find a set of ankle weights that won’t dangle and bulk around, causing you to be uncomfortable. Coming in a 10-pound package, each of the straps has a fixed amount of 5 pounds attached to it. If what you want is some extra resistance to your cardio workout, then these should do the job rather neatly. The fit is very snug, with a secure wide Velcro closure which will fit every lady size. Regardless if you have skinny ankles or not, there’s enough Velcro there to close around, ensuring that you have a good workout. The fabric is very soft, with extra padding to bring you the comfort you need. It’s also moisture-wicking, so regardless if you sweat a lot or not, it won’t start bundling under the cuff. They don’t cost more than your average ankle weights, so all things considered, you will get a good quality product compared to what you pay. They are fairly durable, they don’t slide off their place and you won’t have problems wearing them throughout any aerobics session. Will most likely be small on bigger-sized men. The weight is fixed, and you can only get 5 pounds out of it. It may pinch the skin if used without a sock. 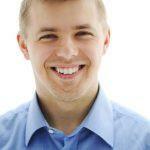 There are many things to consider if you are a beginner on the fitness journey – but also if you are an advanced one. As a beginner, you may want to start with weights between 5 and 8 pounds and slowly rise above that. Purchasing an adjustable set is a budget-friendly option since you won’t have to buy new weights every time you grow stronger. So far, the winner for the best ankle weights belongs to All-Pro, with their adjustable set. Most people love it because it has sturdy weights that you can insert or remove very easily, without losing much of your workout time. They are also securely strapped, and you can get a decent weight out of them for a good workout. Overall, if you add ankle weights to your daily workouts or even walks, you will only reap benefits. Your strength will go up, your resistance will improve, and your legs will be more toned and beautiful than ever – and you can get all these advantages with the All-Pro weights. The right set of ankle weights may also prove to be good as wrist weights, so you should also look for versatility in the right model. Last, but not least, keep in mind that in order to get the best out of a set of ankle weights, you need to work with them for at least 30 minutes every day.